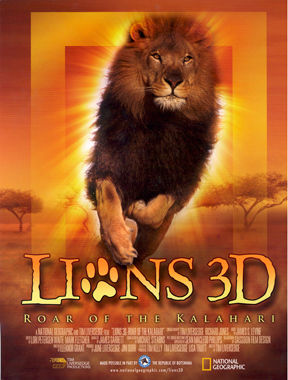 Lions 3D will carry the audience deep into Botswana’s Kalahari Desert, where a life-and-death struggle unfolds between a real lion king and a fierce, young contender determined to oust him from his throne. The interloper gradually encroaches, until an ultimate battle between the two determines the fate of all. The drama poignantly weaves together the day-to-day life of lions with the suspense of rivalry.